Where Did Value Innovation Come From? Professors Chan Kim and Renée Mauborgne, of INSEAD, studied 100 business launches and interviewed hundreds of managers, analysts, and researchers in more than 30 companies around the world to investigate what factors contributed to high growth. They found that high growth in revenues and profits was achieved across industries, across start-ups and established corporations, and across private and public companies. What mattered most in achieving high growth was not the industry or business form, but rather how managers thought about strategy. 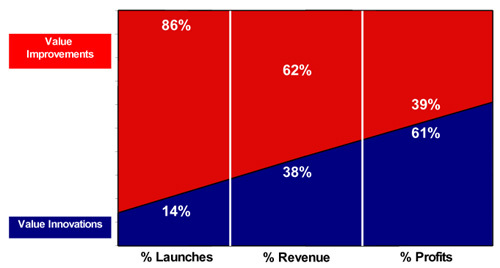 The true value innovations in the study, representing only 14% of the launches, on average generated 38% of total revenue and 61% of total profits. Another way to say this is that the value innovations on average generated 3.8 times revenue and 9.6 times profit over a typical business launch. To learn more about this research please see "Value Innovation: The Strategic Logic of High Growth", Harvard Business Review, Jan-Feb 1997. Professors Kim and Mauborgne codified how the managers in high growth companies pursued strategy in what they called the Six Paths framework. This framework is the process that provides the analytical basis for market exploration and field work required to create new market space. To learn more about the Six Paths framework please see "Creating New Market Space", Harvard Business Review, Jan-Feb 1999. At Value Innovation Associates, we help our clients to apply the Six Paths process to develop Value Innovation growth strategies. Please contact us to learn more.